At the IFA show in Berlin, Acer is showing off its new Chromebook R13, which is the industry’s first convertible Chromebook with a 13-inch display. 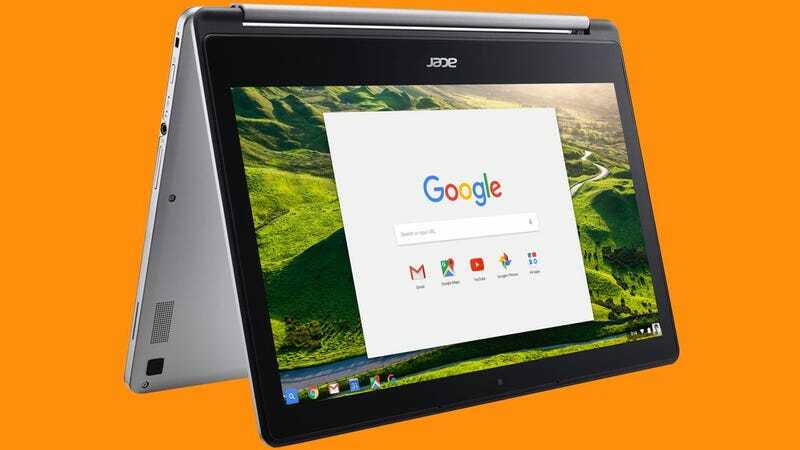 Acer, Asus and others already have Chromebooks in the 10 and 11-inch space that can double as tablets, but this is the first time we’re seeing a larger iteration of a Chrome OS machine that can backflip. The R13 has a 13.3-inch touchscreen display that can be bent into a tablet. The screen appears solid too. It’s an IPS panel with 1080p resolution and 10-point touch capabilities, which supports tapping, swiping, and pinch-to-zoom gestures. A lot of companies (including HP) don’t see the need to include a touchscreen for Chromebooks—Chrome OS isn’t intended for touch and adding a touchscreen drives cost up. Still, it’s a feature that is going to become more and more useful, especially once Android apps hit Chromebooks in the next few months. The Chromebook R13 has a USB-C port, USB 3.0, and HDMI out. It also supports Bluetooth 4.0 and includes a 720p webcam. It’s available with 16GB, 32GB, or 64GB of storage, and all models include 4GB of RAM. These are pretty basic specs for a Chromebook, but the benefit of having a large screen that can double as a tablet could be enticing for plenty of users. Plus, we dig its reported 12-hour battery life. The starting price for the Chromebook R13 is $400, and it will be available in October.